Introduction: Laparoscopic surgery is now well established as the technique of choice for colon cancer surgery. Its application in rectal resections is still under scrutiny/evaluation with increasing evidence in support of a minimally invasive approach. 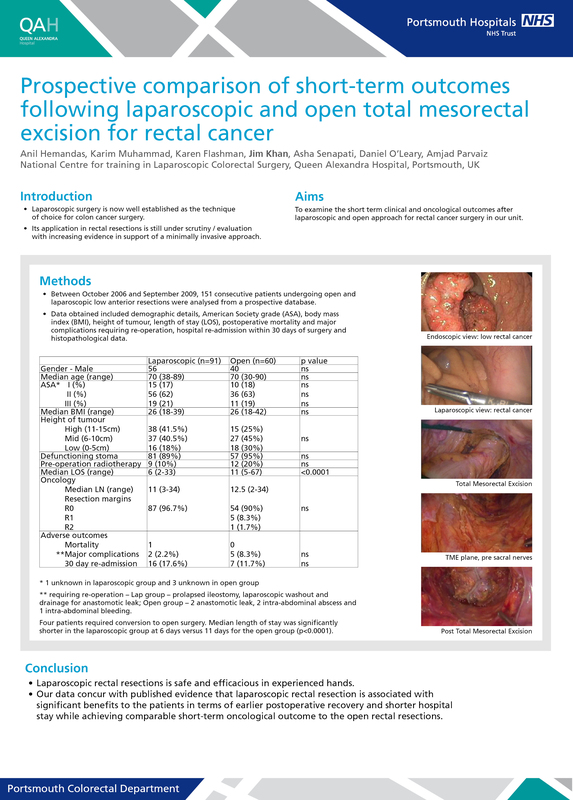 The aim of this study was to examine the short term clinical and oncological outcome after laparoscopic and open approach for rectal cancer surgery in our unit. Methods: Between October 2006 and September 2009 151 consecutive patients undergoing open and laparoscopic anterior resections were analysed from a prospective database. Data obtained included demographic details, American Society of Anesthesiologists grade (ASA), body mass index (BMI), height of tumour, length of post-operative stay (LOS), postoperative mortality and major complications requiring re-operation, hospital re-admission within 30 days of surgery and histopathological data. * requiring re-operation – Lap group – prolapsed ileostomy, laparoscopic washout and drainage for anastomotic leak; Open group – 2 anastomotic leak, 2 intra-abdominal abscess and 1 intra-abdominal bleeding. Four patients required conversion to open surgery. Median length of stay was significantly shorter in the laparoscopic group at 6 days versus 11 days for the open group (p<0.0001). Conclusions: Laparoscopic rectal resection is safe and efficacious in experienced hands. Our data concur with published evidence that laparoscopic rectal resection is associated with significant benefits to the patients in terms of earlier postoperative recovery and shorter hospital stay while achieving comparable short-term oncological outcome to the open rectal resections.